According to Tourism New Zealand, the ‘Land of the Long White Cloud’ enjoyed an 8.6% increase in arrivals to New Zealand in comparison to 2013 with 12% of international visitors citing The Hobbit as a factor in them taking a trip to the country. Hop-on hop-off bus network Kiwi Experience offers a sociable way to discover the movies’ most iconic locations while in the company of fellow adventure-seeking passengers. Since 2004, the phenomenon, known as ‘Tolkien Tourism’, has seen an average 47,000 tourists visiting the Lord of the Rings and The Hobbit filming locations each year to experience the magic of Middle Earth first hand. “The number one movie location has to be Hobbiton! Begin your journey through Middle Earth with a tour of the Hobbiton Movie Set near Matamata in the North Island of New Zealand. 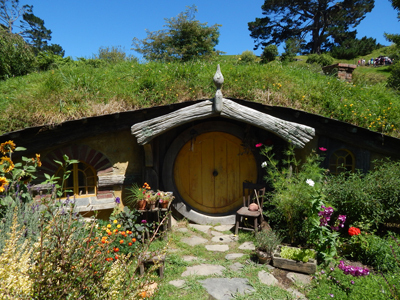 The two hour tour allows guests to literally step into the world of a Hobbit. All sets are all still standing ready to be explained, including the famous Party tree, Bilbo Baggins house, Hobbit Holes, The Mill, double arched bridge and other structures and gardens built for the films. The photo opportunities are limitless, and guests can end their visit with a trip to The Green Dragon Inn, a replica of the inn in the films, and a complimentary brew from their exclusively crafted Southfarthing range.” Kane-It, 15 years on the road with Kiwi Experience. “Wellington, New Zealand’s Capital City is home to Weta Workshop, a world-leading design and effects facility which provides costume, imaging, props, special effects, hair and make up for the film industry. Visitors can take the Weta Cave Workshop Tour which is a 45 minute guided tour that starts and finishes in the famous Weta Cave and provides a behind-the-scenes glimpse into the workings of Weta Workshop. There are also plenty of shooting locations to be found across Wellington such as the Quarry used for Helms Deep. One of the most easily accessible sites in the city is just a short scenic walk up Mount Victoria to see the scene where Frodo and Sam are hidden below the roots of a tree from the Black Riders.” Rik, six years on the road with Kiwi Experience. “Venture off the beaten track to the picturesque and remote River Valley Lodge on the Rangitikei River. This is one four rivers used as the River Anduin in the trilogy. Follow in the footsteps of the Fellowship who floated down it in a canoe and go white-water rafting down the river to get the full experience.” Bridget, two years on the road with Kiwi Experience. 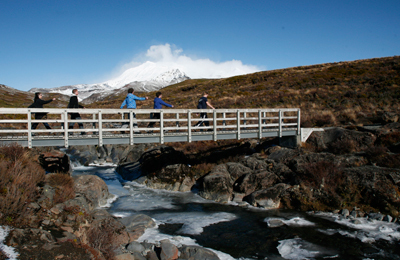 “Tongariro National Park is home to the Tongariro Crossing, one of the ‘top ten day walks in the world’ according to National Geographic. This park is where you can really get close to the most iconic scenery from the trilogy including the instantly recognisable cylindrical cone of Mount Doom. It’s also easy to see why Tongariro National Park, a Dual World Heritage Site, was chosen as the location for the Plains of Gorgoroth. We can look up at the North Islands largest Mountain, Mt Ruapehu, and be looking directly at Mordor. It’s on the largest ski field in the country, Whakapapa, that Sauron has his finger cut off and Frodo and Sam catch Gollum who leads the hobbits down the Emyn Muil!” Kane–It, 15 years on the road with Kiwi Experience. 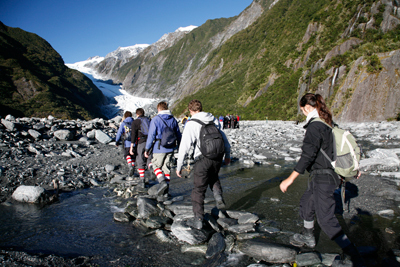 “Walk up Franz Josef glacier to see Ered Nimrais, where the beacons that run from Gondor to Rohan along the White Mountains were lit. It is best seen from above and the views are well worth the climb!” Dallas, 15 years on the road with Kiwi Experience. “A relaxing evening spent with a cold beer on the shores of Lake Wakatipu in Queenstown is the perfect way to soak up the incredible views. Even Sean Astin, Sam the hobbit, said he felt like he was actually living the books in this city! More adventurous souls can bungee jump off the famous AJ Hackett Bridge, beside the spot of the confluence of two famous rivers, the Arrow and the Kawarau. This is the location where the Fellowship are filmed paddling down the Anduin River past the Pillars of the Kings.” Mangee, six years on the road with Kiwi Experience. “Look right as you are crossing the Pelorus Bridge and you can picture the Dwarfs from The Hobbit: The Desolation of Smaug, floating down the River in Barrels.” Josh, four years on the road with Kiwi Experience.